It’s been awhile and many of you have asked me for an update on what I currently do and use on my hair. I currently have a protective style in so this post is about what my routine is on my own hair when it’s not in a extensions. I’m going to split this into two posts. This first one is on my routine. The next will be specifically on the products I use. My hair is currently about shoulder length. I recently had a trim before installing my Havana Twists. That’s something that’s sort of in my routine – every 4-6 months I have a slight trim. My hair in general is easier to maintain because of the increased length but I find it harder to style sometimes. 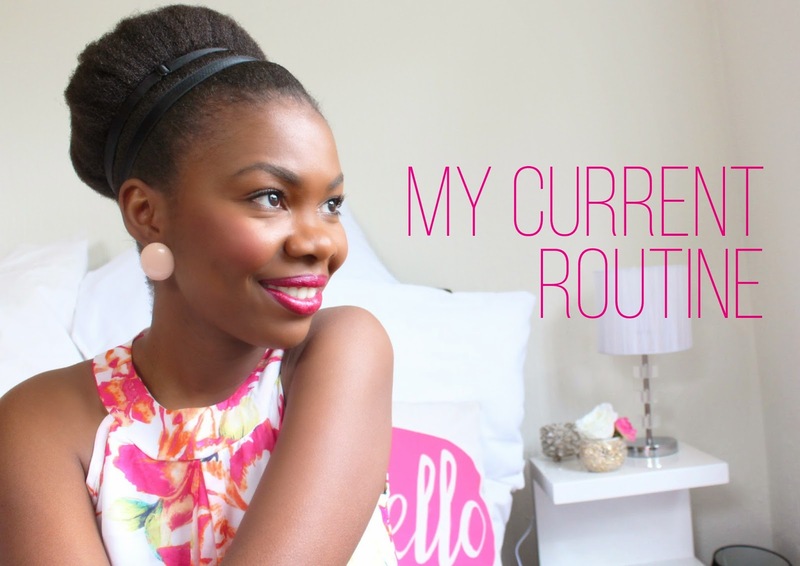 My evening routine is much shorter and I’m not always trying to get my hair curly. I do keep it stretched between washes as the longer my hair gets the more tangled it gets so wash and go’s are a sign that I am in for it the next wash day so I avoid it as much as possible. I’m currently washing and deep conditioning my hair every two weeks, alternating between using shampoo and conditioner. I’ve noticed that my less frequent use of gel leaves my hair cleaner for longer. I wash my hair in 4 big sections, keeping them apart with hairbands. I comb and detangle my hair once a month with a wide tooth comb. This has become less frequent because I’m always in stretched styles so thankfully the tangles aren’t as hectic. I do it with conditioner on and in the same sections as when I wash.
Every night I prep my hair by either dry twisting into about 6 big sections or 4 big braids or two pigtails (!) I’m loving the pigtails one because it takes 2 minutes and it’s a cute way to leave the house to stretch on the go. I’ve washed my hair a couple of times on a Monday morning before work and I put my hair into two very low pigtails, flatten with my scarf, slap on some lippie and off I go. This has become my favourite new thing with my hair. And if I’m super busy, I’ll rock the pigtail look for a couple of days. I still spritz my hair twice daily. My hair is dry and this Jozi dryness doesn’t help issues! 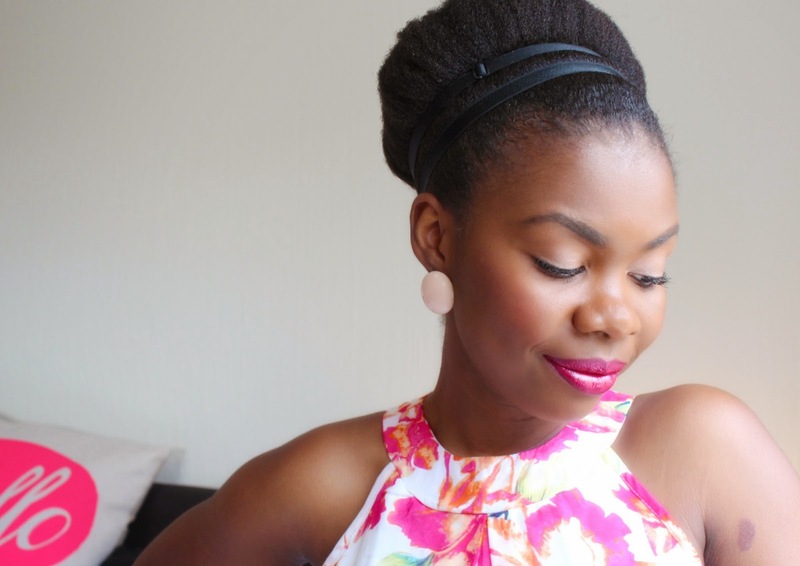 So I spritz before I undo the stretching style – be it twists, braids of pigtails so it doesn’t shrink back. And that’s it! It’s less maintenance now but uses a lot more product which makes sense. I do wish I could wear my hair in a more shrunken state more often because it looks fuller and funkier but it’s just not something I can rock for more than a day without regretting it. Look out for my current products post, coming soon! Thank you. Eagerly waiting the product list, more especially what you put on your daily spritz:). I was in Joburg last July and got to experience the Jozi dryness you speak of! I wore my hair out the whole time I was visiting and I definitely had to make sure my moisture game was on point but I actually enjoyed your winter. Ours are treacherous here in New York City. Lol. My routine is similar to yours when it comes to washing. Oh wanted to ask how do you deal with shedding. I get so much shedded hair that gets caught in the with the other hair and causes breakage. Hey Nzilase, I don't usually have that problem because I details regularly and also keep my hair stretched as often as possible. Maybe something to try? I was actually doing some research on it and keeping the hair stretched really helps. Thanks for replying. Oh and your skin is beautiful. A skin regime post would be great, yes/no/maybe?